go into Live mode under user root. No password required. In this case, once in the system, type in the command startx to start the graphical interface. That was the sequence of operations I followed. As a result, I again got into the black screen, but this time I had some “kind of” graphical items on the screen. I call them “kind of”, because graphically they are very basic. This is actually relevant to the whole screen design. Fonts are taken from the 1980s. The window decorations are rainbow-style titles with ugly control elements, the same age as the fonts. Scrollbars are on the left side of the windows. In other words, the default configuration of the window manager in DragonFlyBSD 2.10.1 is far from modern, unlike the ones that most users are used to. I believe that the window manager itself is FVWM. There is an option listed in the menu which offers you other window managers. Even GNOME is listed. But all my attempts to change the window manager to something more graphically attractive in Live run led to nothing. There were 2 xterm (Terminal) windows on the desktop. I don’t know why would you need 2 from the very beginning, but let’s pass on that. The top left corner of the screen has kind of shortcuts to applications: same Xterm and Firefox. The bottom-right corner of the screen is taken by a pile of buttons, which act as a taskbar. Each new window gets a new button there. 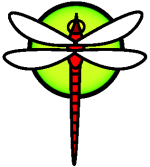 But, again, their design, like everything in DragonFlyBSD, is taken from the 1980s. Middle part of the right-hand side of the screen is taken by clocks (both analogue and digital) and a calendar. Basically, that’s all about the desktop which greets you. Nothing impressive. I would rather say, very disappointing. Because of the simplicity of the desktop, there is nothing like a notification area. Also, because of the simplicity of the system menu, (more of that later), there are no configuration utilities at your fingertips. That is why I found no option to configure network. I simply did not find any application or configuration utility for this. They may exist, but without proper guidance, it is not an obvious task for an unprepared user. But my gut feelings are that most of the configuration is manual via the appropriate files. There is no dedicated menu button in the interface of DragonFlyBSD. 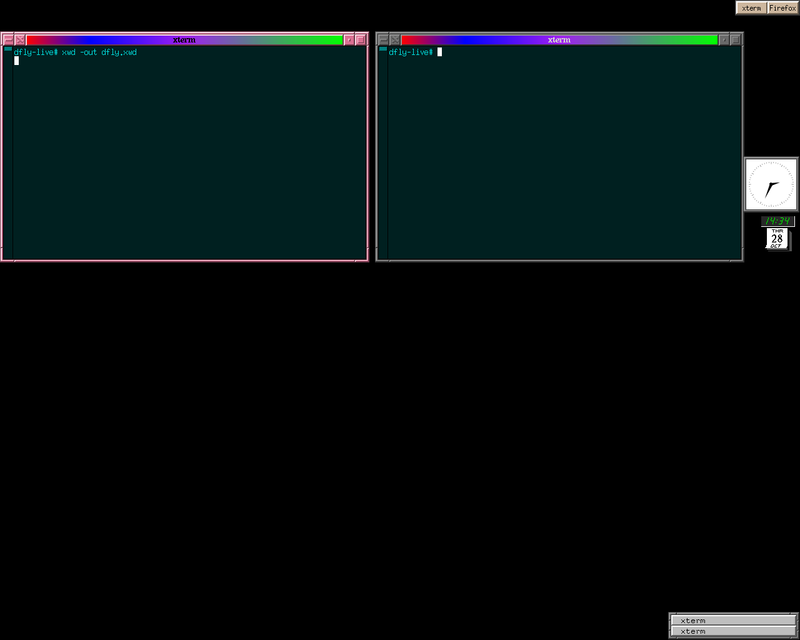 But, as in many other window managers, FVWM shows menus when you click on any empty desktop space. Left and right clicks on the desktop call different menus. Left click is dedicated to window management: close, move, resize, destroy and so on. I am not so sure why this would be necessary when clicking on an empty space. Right click calls up something resembling the menu itself. But, there are not so many items in the menu. Apart from Xterm and half a dozen utilities like Calc or XEmacs, I have not found anything interesting. Even Firefox was not listed in the menu. Not all the applications listed there are truly graphical. Rather, they are like ncurses based applications. The only truly graphical application which I managed to start in DragonFlyBSD 2.10.1 was a Firefox browser. As I said above, there is a shortcut button in the top-right corner of the screen. Firefox is version 3.6.16, which was pretty recent on the date of OS release. DragonFlyBSD 2.10.1 did not mount any existing partitions on the local hard drive. I tried to mount one of them, but my knowledge of BSD principles was not enough for command-line operations. I tried to use the command mount -t ext2fs /dev/da0s8 /deb, but it gave me an Invalid Argument error, complaining about the /dev/da0s8 part of the string. I could see da0s8 listed in the output of command ls /dev. That left me struggling with trying to understand what was actually required from me. That was end of my play with DragonFlyBSD. I logged off using the command reboot now in the terminal. Honestly, I don’t think DragonFlyBSD is the operating system you would consider using on your desktop. There are too many alternatives which are more attractive from an end user point of view. The BSD family has some even better candidates for desktop, like GhostBSD or PC-BSD. Whom will DragonFlyBSD interest, then? First of all, BSD enthusiasts. But that’s to the smaller degree. First of all, it is targeted to people who work with servers. Why? Because one of the main tasks of DragonFlyBSD project is system optimisation for high-performance servers, not user workstations. did you get a chance to play around with its performance as a server on your network? - how unexpected are the commandline tools available, compared to what you're used to in Linux? I would expect BSD to show differences, and I'm *not* saying that either is better than the other, but notable surprises should be reported by scouts like yourself. - is there any kind of package management for bringing in tools other than wget-configure-make? How about for major server-apps, the way Debian has everything from simple scripts to CMS like Drupal sitting in the repos? - once you got to the commandline, how was network configuration? Again, are there surprises compared to Linux? - what non-GNU tooling did you unexpectedly find yourself using? - how's the documentation in BSD-land, especially the man-pages and (*gag*) info, compared to Linux? Sorry, I have not run DragonFlyBSD on any server. Primarily, because I don't have any server equipment. Then, because I do my reviews from the point of view of usual user, not server administrator. That's pointed out in the very beginning of the post. That's why I unfortunately cannot answer any of your questions. DarkDuck, as the guy at he top said this is basically a server distro. Maybe the project's page doesn't clearly state this, but the horrific screenshot from distrowatch says it all. I once tried to learn how to configure fvwm and I decided it was much easier to dig a hole in a concrete wall using a lolipop. The screenshot on Distrowatch is terrific, you're right. At the same time, screenshot at LWN is much more promising. As far as I remember, Puppy also uses FVWM. And it is far more user-friendly. Puppy's got JWM (Joe's Windows Manager) and it is pretty user-friendly. The LWN screenshot is FluxBox (one of my favorites) The thing is, fvwm is an _awesome_ window manager, for which I'll never have the time and energy to invest learning how to produce a decent config file (the stock one is unusable) and tailor it to my needs. Yes, you're right about Puppy. But I saw FVWM in Austrumi. The results are awesome there! Just peek at the screenshot I got in my review! too bad this is all dragonflybsd can do, I just recently started to get familiar with the bsd's family and dragonfly seem to have a promising future (from a simple user, non developer POV). You are welcome. It is nice that you liked the review. Though, I still do not think that DragonFly is targeted to the ordinary users.